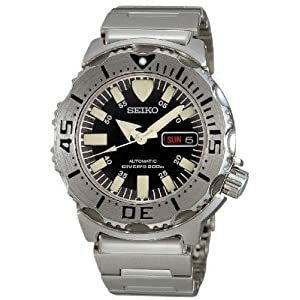 This is a solid, reliable and high quality dive watch that is water resistant to 200 meters (660 feet). With a name like Black Monster you'd expect it to be huge, but it's not much bigger than a standard watch. It uses an automatic movement and is self-winding, so no battery replacement is needed. The watch itself is rugged and nice looking. Stainless steel bracelet and bezel look great against the black dial. The bezel rotates in one direction only, which is standard for diving watches. The calendar shows the day and date. Luminous hands and markers help tell time in low light. If you're looking for a cool watch for the perfect gift, this is a nice choice.